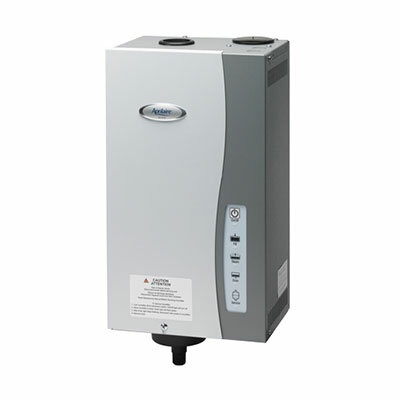 Aprilaire Model 800 steam humidifiers use electrode technology and are simple to install, operate, and maintain. With electrode technology, electrical current flows between submerged electrodes, resistance of the water to the electric current heats the water. The submerged electrodes are found in a replaceable canister. At the end of a humidifier season, the canister – including the electrodes, is replaced. No cleaning, no scrubbing, simply replace the canister and you’re ready for the next humidifier season. Electrode technology requires impurities in the water to promote the transfer of electricity. For this reason, water filtration is not required with electrode technology, minimizing the complexity of the installation and on-going operating costs.